Well..it is time to do another ofiget-or-ppc trip, and this time the main goal will be Moscow - and instead of going from Gardermoen, I have decided to save a car trip and parking cost and instead go via my much more local airport located at Rygge - http://www.ryg.no - and go via Riga with a couple of nights there. This will allow me to get a taste of the old city at least, before heading on to Moscow, where I have decided to stay for 5 nights. I have chosen to go with Ryanair - http://www.ryanair.com - for the first time - their flight to and from Riga costs me around 60 EUR including my checked-in luggage, which is actually 60% of the total cost for my ticket. To go further to Moscow, I will use Air Baltic. As usual, I will need an approved visa to enter Russia, which I sort via a travel agency named Privjet! - thankfully they also deliver the visa application directly, as the Russian embassy does not accept this via 'snail mail'. My flight with Ryanair is uneventful, and apart from the ghastly yellow colour inside the cabin, it is quite ok. We land before schedule, and it doesn't take me long to go with Air Baltic's airport express service to get to the centre of town and check into my hotel - Radisson Blu Elizabete (formerly belonging to the Reval chain) - in fact not much more than half an hour has passed since my flight landed. I have a good chance to relax and experience the room, which is very nice indeed - according to the website's own information it is supposed to be 29 square metres but it feels somewhat smaller. I have two large beds, a flat screen TV, tea and coffee making facilities, a somewhat poorly functioning A/C, but lo and behold - the window can be opened! The wash basin is halfway integrated into the main room, while the toilet and shower cabinet (yess!) is only separated by a non-lockable frosted glass door - perhaps not the best solution for non-intimate partners. I head out into town - not the old part, I will save that for tomorrow - but go to a chinese restaurant which I discovered on the inyourpocket website, Lielais Ķīnas Mūris, meaning 'Great Wall of China'. Here, I have a fairly normal chicken style dish with some nuts, fried rice as a side dish, and order dessert - my favourite - fried bananas, but the size is almost as big as my entire dinner! I ordered white wine to my dinner, but got red wine, and had some plum wine together with the dessert - mmm, and a full glass it was too! I do not need to walk back to my hotel - I can easily roll back! Today I will explore the old town of Riga. I picked up a tourist brochure at the airport, which looks surprisingly like the one inyourpocket.com makes - even the text describing the places to eat and stay is exactly the same! But the name of the guide is 'Riga insight' - I wonder if they have changed name? From here I head straight down to the freedom monument (Brīvības piemineklis), raised in 1935 to symbolise freedom (!) and independence. The figure at the top is named Milda, and the three stars she holds represent the three regions - Kurzeme, Vidzeme and Latgale, but first crossing a small park and noticing the locks on the railing - no doubt from newlyweds? 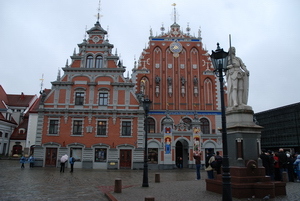 I drop by the National Opera house and sigh at the dry fountain in front of it, then go further past St Peter's Church (Pēterbaznīca) to the town hall square - Rātslaukums, but the town hall itself is fairly unimpressive - the show stealer is definitely the House of the Blackheads (Melngalvju nams) - originally built in 1334 by the Great Guild, it later became the home for an association of single merchants known as 'Blackhead'. It was destroyed in 1941, then beautifully rebuilt in 1999. I head on towards the main cathedral in the town, which houses a very impressive church organ. On my way around, I see that there are organ concerts, and on my second visit here I hear some sweet notes from inside, drop in and find out that today's small concert was just finished. Wahh! Next up is the castle, which may be best viewed from the river side or even the main bridge crossing over the very wide river Daugava. While the castle isn't particularly impressive, the riverside makes for an open-air break from the narrow streets of the old town, but it is fairly windy and cold, so I do not stay there for long, but instead decide to go for lunch nearby - Michelangelo is an italian restaurant, and I have a great (but small) portion of minestrone soup, a pasta dish and panna cotta for dessert. And a glass of red wine :) It is quite a nice place, but the service feels somewhat cold - but all are guys..who knows. I head further on along narrow streets, an old barracks house which has been converted into a series of shops and restaurants (as mostly everywhere in the old town), and see various neat Art Noveau buildings - Riga really has a lot of these, some of them have beautiful decorations and figures/faces. I head over to Līvu square where the Great and Small Guilds were, and notice another building by chance - the Cat house. The story goes that the owner of the house wanted to join the Great Guild, but was refused membership. In revenge, he had two iron cats erected on the gables of his house with their tails turned towards the Great Guild building across the street (the expression "I fart in your general direction" comes to mind here...) When he was eventually admitted to the guild, he turned the cats round. Another legend states that two neighbours led a cat and dog life and one of them put a figure of a cat, with its back to the street, on the roof. In return, the other neighbour put a dog on his roof across the street. Yet another version of the legend suggests that the architect who put up the cats, fell down from the roof to his death...any more suggestions? Well, that is enough for one day - I head back to my hotel and have some rest before I go out with my tripod for some night shots - first of all I head to the Blackheads' house which I know is beautifully lit up, then down to the bridge across Daugava and to shoot the beautifully blue-lit railroad bridge. 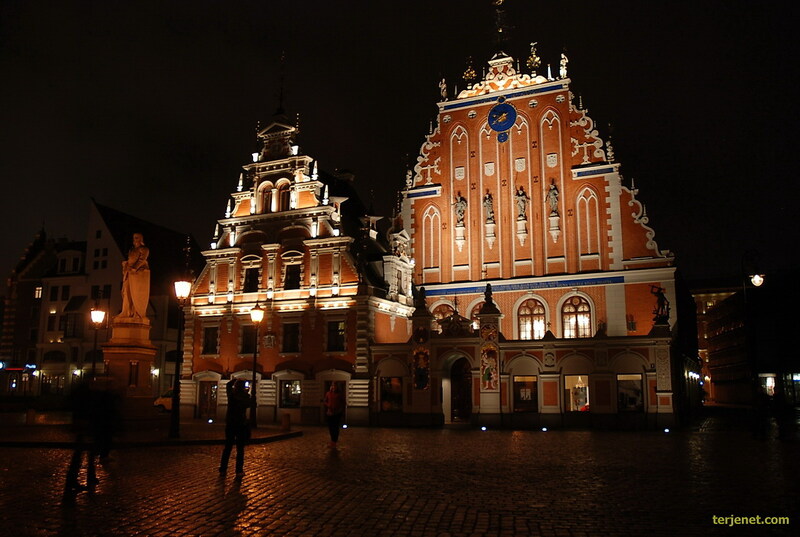 As I go back via the Blackheads' house, I decide to take one more pic of it before it disappears from view, but as I lift my camera up, the building goes all dark - at 19:30! What is going on? Are they saving electricity - so early in the evening? And then a 3-minute classical music/flood light show starts! I never heard or read anywhere that this would happen - I enjoy it greatly and decide to come back after dinner. Thankfully I have an extra, smaller camera with me which can record HD video - and of course I use the opportunity to do so! Dinner - I decide to go for the somewhat expensive, but stylish and old Rozengrāls - first mentioned in 1293 according to their own information - where waiters are dressed in medieval costumes, the dining halls are like dungeons, and the food is...old without being dangerous - that is, the dishes are from medieval times! I go for a pork shank, which looks different from what I expected - it comes with spicy cabbage and horseradish, a side dish consisting of boiled pearl barley with prunes, onions and pumpkin seeds, an apple drink with honey and mint leaves, and red wine..altogether at 20 LVL - still quite a bit cheaper than at home, and it took me the better part of an hour to consume the meat parts of the pork! I head back to the Blackheads' house at 21:30 and record the show from the beginning now - a nice extra touch together with the pictures! But the night isn't over yet for me - I do want to try out the 'Sky bar' on the 26th floor of the Radisson Blu Latvija, and order first a 'Wrong Island Iced Tea' where I think the soda is exchanged for Riga balsam, and some Red Bull is added too...then I have a 'Mai Tai' before heading home, well into the night..somewhere between 1 and 2 am. This will be a travelling day, as I see it. Little did I know how long it would turn out to be, and that was in a way a good thing - if I had known, I wouldn't even have wanted to get out of bed! Breakfast at the hotel is great, it is indeed a buffet as expected from this chain, and I have to have an early one to check out in time and make my way back to the airport, as my Air Baltic flight is scheduled for lift off at 11:40. "What is your purpose for visit to Riga?" Tempting: "To head back to Air Baltic's ticket office and raze it to the ground - do you mind?" So the ticket clerks - five of them - have a lot of work on their hands, and I end up waiting in a very short line with maybe 6-7 people ahead of me - for an hour, before I get the possibility to go on the 19:10 flight to Moscow instead! Nice! And throughout our wait, we have received a voucher for a 5 LVL meal + 1,50 LVL drink at the airport. Starvation rations, if you ask me! Thankfully I do not have to pick up my luggage, but have to go through security check as well as passport/visa control yet another time before heading to a much more comfortable gate lounge (one without metal seats). And we get a Boeing 757-200 instead of a 737-500. Whee! I seriously do not like Riga airport. It is small, narrow, cramped - and there is no separate arrivals area - you have to plow straight through the queues at the gate as you exit from the aircraft. And most of the seats are uncomfortable and made of metal - cold on your popka! 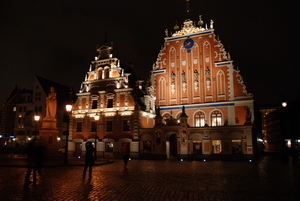 Some Koreans seem to have to spend the night in Riga, since they will miss their connecting flight. A Russian girl that I talk to in the check-in queue is going further into Siberia on the same day, if she gets a flight. This time, our flight does indeed leave at 19:10. And the aircraft is the most comfortable one during my trip - it is my first time in a 757. But my pre-ordered and pre-paid meal disappears into thin air, as they do not have hot food on this flight! I have to ask the crew what to do, and if I even may have to pay to get something to eat after all this wait and starvation rations courtesy of Air Baltic - "we thank you for not flying with us!" But I get an option of a lighter meal, which I take, just to be done with it. But it seems they will be keeping some additional value for my meal. The flight lands at 21:45 Moscow time - it is getting quite late now, and before I get through passport and visa control and pick up my bags, I rush through the 'E' terminal at Шереметьево - Sheremetevo towards the Аероэкспресс - Aeroexpress and make it in time for the 22:30 departure. I have thankfully pre-paid my ticket on their website. The train will take me directly to Белорусский Вокзал - Belorusskiy Vokzal, from where I will be able to get onto the metro. The train ride is very comfortable, although I am beginning to get too tired to appreciate the comfort. I arrive at the train station at 23:05 as scheduled, then look for the metro station, which should be right nearby. But outside there is a huge construction work going on, and the signs to the metro point both left and right with no clear indication which direction is which, or even which line is which, as two lines cross at this station. I decide to head towards the right, where most people seem to be going, pay my double price ticket (because of the luggage), and haul it down to the metro station, where I find the correct line, but it is only going in the wrong direction! Normally lines go in both directions at a station - but this seems to be an exception for an unknown reason. And my troubles do not end there - the crossing to the other direction of the line is closed due to construction work, as far as I gather from a sign bearing a few familiar words: переход, закрыт - perekhod, zakryt - walkway/transition closed. Great. Do I walk all the way back to the train station and try my luck with the sign in the other direction? Or...it is beginning to get pretty late - 23:30 or so, and I know I have only 1 1/2 hours left before the metro shuts down for the night, and I would REALLY like to reach my destination before that happens! I study my own map which I brought as a backup, since I find no map in the station itself. So if I take the circular line #5 instead in a counter-clockwise direction (the only direction available at this part of the station) for 6 stations, I will reach the southern crossing between the circular line and line #2, which will take me to my destination - station Домодедовская - Domodedovskaya. So I hop on and go...and the stations are quite far between, considering the speed of the metro (up to 90 km/h) and the time it takes between stations - 3, 4, maybe even 5 minutes. I reach station Павелецкая - Paveletskaya, and cross easily enough to line #2, then stay on for 7 stations before I reach my goal. I remember checking on Google maps and seeing that the exit from the station seems to be on the right side of Каширскойе Шоссе - Kashirskoye Shosse. At midnight, I start my walk in the direction of my hotel - or so I think. After walking for more than 20 minutes trying to find the outline of my hotel in the dark suburbs, I realise I must have been going in the wrong direction. What confused me even more was that I saw a sign pointing to the name of the street where my hotel lies - Шипиловская Улица - Shipilovskaya ulitsa - but I definitely can not see anything resembling my hotel there or anywhere else! I can still feel my back and shoulders aching somewhat from last day's trials and tribulations. Breakfast is really good, with a wide variety of choices - several types of cereals, bread in white, dark and rye editions, meats, cheese, juices, coffee, tea, boiled eggs, scrambled eggs, bacon, sausages, fruit...everything you need to fill up your tummy and have a good day's start. I do have a plan for what I wish to see. But which days do I choose to go where? And will I regret it later due to weather, good photo opportunities etc? And how do I move around as efficiently as possible so that I do not spend half my time inside the metro and walking between stations and sights? It must have been 11 o'clock at least before I head out, but I did need that extra rest. I decide to go towards the Moscow University or МГУ, Московский государственный университет имени М.В. Ломоносова - MGU, Moskovskiy gosudarstvenniy universitet imeni M. V. Lomonosova (phew!). My metro station is Университет - Universitet on line #1. 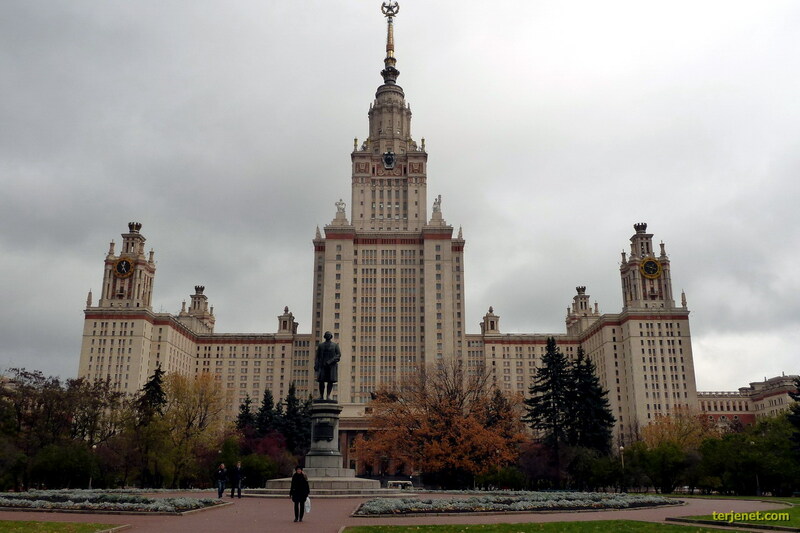 The reason why I want to visit it, is that the main building is quite an impressive one - the largest of the so called 'seven sisters', built in the gothic Stalinist style. The university is the largest in Russia, employing 4000 academic staff as well as 15000 other staff members, and houses 36000 students and 7000 post-graduates. Just getting here via metro and walking takes almost 1 1/2 hours, so by the time I am finished taking pics and moving on, lunch time is already nearing. Thankfully, my next destination is only 2 stations away, at Спортивная - Sportivnaya, and I stumble over the familiar ресторан - restoran sign somewhere, and decide to take a look. A quite cosy tavern-like place is hidden inside a narrow back alley, and they have so called business lunch at this hour. There is no english speaking staff, and the menu is only in cyrillic. I do manage to navigate it and order a portion of борщ - borshch - classical Russian beetroot soup at 50 roubles, and a glass of wine at 100 roubles. Quite a bargain - I just wish I could get the waitress to understand that I wanted more, but she just wants payment...ah well, maybe she thought I looked like I could use a diet? My next stop on the list is Новодeвичий монастырь - Novodevichiy Monastir', a UNESCO World Heritage site, even! I see the walls and onion rooftops, but the first entrance I take leads me only to a separately walled cemetery, which I end up trawling halfway around before heading out and going along the wall to the proper entrance. On the outside, there is a nice pond which makes for an excellent foreground for a photo - I just wish the weather would have been better! Anyway, I decide to head on and go to the centrally located station Библиотека Имени Ленина - Biblioteka Imeni Lenina, and take a peek at Красная Площадь - Krasnaya Ploshchad' - Red Square. But I end up at the wrong side of the Кремль - Kreml, near Александровскй Сад - Aleksandrovsky Sad. As I try to go around the south side, I notice that the city isn't too pedestrian friendly - there are big boulevards to cross all around, and they cannot be crossed above ground, unless you have a serious death wish. So I search for underground passages, and in the end head towards Храм Христа Спасителя - Khram Khrista Spasitelya - Church of Christ the Saviour. It was originally built to commemorate the retreat of Napoleon in 1812. It took a long time before building was started, and it lasted from 1839 - 1883. Incidentally, Tchaikovsky's 1812 ouverture debuted there in 1882. It was a prominent site in the city, and on Stalin's orders, the church was blown up in 1931, as it was to be replaced by a giant 'Palace of the Soviets', which with its planned 100-metre statue of Lenin on top, would rise to a height of 300 metres. Thankfully, none of the plans were realised due to the second world war, and in 1994-1999, the church was rebuilt to its former glory. A footbridge across the Moscow river was added in 2004, and makes for a perfect photo opportunity, and also gives a fairly good view of the recent 90-metre statue of Peter the Great, which sits on an outcropping in the Moscow river. It was built to celebrate the 3rd centennial of the Russian navy. On the way back, I want a second lunch, and try to enter the restaurant 'Akademiya' which lies just behind the church. I am denied entry due to it being full, I am told - or was I just a sudden victim of face control? I thought that was mostly in night clubs...hmm. I find another place nearby anyway, and order some local dishes: beef stroganoff, shashliki and a glass of red wine - I feel I have earned it (?) - and everything tastes great! According to the receipt, which I kept, the name of the place is Стар Компани Боровицкая - Star Kompani Borovitskaya. Finally I head back to Red Square and take a look around - there is the Государственный Исторический музей - Gosudarstvenniy Istoricheskiy Musey - State Historical Museum in one end, Собор Василия Блаженного - Sobor Vasiliya Blazhennogo - St Basil's Cathedral with its easily recognisable candy-like onion domes, the walls of the Kremlin with Lenin's mausoleum in front, and the giant department store known as ГУМ - GUM dominating it all. As I arrive, it is beginning to darken, and GUM is beautifully lit up already - it looks like a cross between a castle, a drawing, and a circus. It is a lot to take in at just one visit, but I know I will be coming back here during day time as well as at night with my tripod! Tonight, I decide to have dinner in my hotel's restaurant Tiberio, and order borshch, a chicken dish with 'Pushkin' style potatoes - boiled, then fried for a short moment, and a glass of white wine. Yummy! After breakfast, I decide to go for a short walk at first. As I was reaching the 18th floor with the windowed elevator yesterday, I noticed the blue roofs of an orthodox church - one that I had seen described and pictured somewhere. I have learned that its name is Храм Троицы в Орехове-Борисове - Church of the Holy Trinity at the Borisovo Ponds. As recently finished as 2004, it is built in a Byzantine style, rises to a height of 70 metres, and I must admit - actually looks a little bit misplaced in the far southern suburbs of Moscow. With that in mind, I head back to my 'home' metro station and reflect on the endless rows of apartment blocks - very Soviet style, as I would expect it to be. But my next goal should be more uplifting - Царицыно - Tsaritsyno. It is only 2 stops towards the city centre - definitely my nearest 'sight', if not counting that nearby church. As I head out of the station and onto the local train station with the same name, I walk of course in the wrong direction, and end up face to face with a fence separating me from the railroad tracks. I backtrack, and head beneath the railroad and easily recognise the entrance to the big park, then as I pass through the gates, I see the palace in the distance. The sun is shining, but there is an icy cold wind sweeping across the small lake and its surrounding park. The residence is also quite huge, in a way similar to the palaces in St Petersburg, and indeed it was built for none other than Catherine the Great between 1775 and 1796, but it turned into a ruin and was only completely restored in 2007. The total area of the park is 700 hectares or 7 square kilometres! I decide to not go inside, but satisfy myself by walking around the palace to the back side, then back to my metro to head into the city centre. Or to be more precise, a little bit outside, as I have decided to pay a visit to what I consider to be the most awesome of the metro stations in Moscow - Комсомолская - Komsomolskaya! But as I appear on line #1, I see that this is not the Komsomolskaya that I want to see, so I realise that since it crosses circle line #5 here, I head to the 'perekhod' to that one, and as my escalator brings me up, I am greeted with something that is as close to an underground palace that I have ever seen. With a yellow roof, intricately carved decorations and huge chandeliers, it definitely is a sight not to be missed. 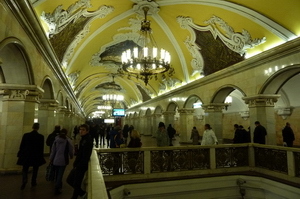 The other two stations depicted are Paveletskaya and Arbatskaya, respectively. I head back to the city centre again and pay a visit to the outside of a theatre that should need no further introduction - Большой театр - Bolshoy! I have heard that the grand hall is being refurbished, and do not know if it is finished yet - and anyway, I don't think I have enough time and budget to give priority to a performance there, sadly enough...it was the same thing I felt with Mariinsky in St Petersburg, and I did not even have the time to see the exterior of that one! I have a very late lunch at 16:00 in Aleksandrovsky Sad's 'Planet Sushi', where they have a great offer of 8 pieces for only 245 roubles! A bargain, considering the central location. I also decide to be a bit adventurous when it comes to drinks: японский глинтвейн - yaponskiy glintveyn - which I manage to translate into 'japanese mulled wine'. For a change, I return to the hotel earlier, but still end up having a late dinner - on Арбатская Улица - Arbatskaya ulitsa, at one of the 'Ginza project' chain restaurants. A well made Caesar's salad with chicken, and I try for the first time another classical Russian dish - солянка - solyanka, and this is very good too! Whisky and cola?? Yes it tastes much better together! And before I am finished with this, it is 22:00! Where does all the time go? Is it me still being on my local time? Is it all the travelling back and forth from my suburb? Is it all the walking around? Is it the sightseeing? Is it the stars aligning with the birth dates of the countless models on high heels? I will go to bed earlier tonight..which means before 02:00?? After finishing breakfast at almost 11:00, an even more cultural experience awaits: a visit to the Государственная Третьяковская Галерея - State Tretyakov Gallery. A modest entrance fee of 150 roubles awaits, but after looking around in the various rooms, which seem a bit labyrinthical at first, I end up with the feeling - isn't it supposed to be more than this? Then as I read up while writing this, it seems that the gallery is housed in several buildings, including a much larger one than the 'classic old' from the early 20th century. As for the gallery itself, it houses many portraits of Russian celebrities throughout the years - at least I recognise mr Pushkin, as well as quite a few large pieces of work. The little that I see is quite impressive, but it makes me wish I had read more beforehand. Time for lunch already! And I find myself at a nearby place called hmm...I can't find any name on my receipt, unfortunately. But I have borshch, and 'potatoes mush' as it says, and a classical Russian non-alcoholic drink: морс - mors, possibly made from cranberries? Red Square really has to be visited on such a day - the sky is actually perfectly blue, something I did not expect to see during my visit at all! And yet, time flies waaaaaaay too fast..and at 18:00 I end up taking a couple of pictures in the 3-station-square, with railroad stations Ярославский, Казанский & Ленинградский lying on each side of the square - with many eager taxi drivers around. I also see two more of Stalin's 'seven sisters' here, one of them being Hilton Leningradskaya. One more day before heading home. And I know I have a busy day today, that's for sure, if I want to stay true to my plans. The real Kremlin! Fortunately, getting a ticket and getting inside takes little time. And it was only 200 roubles, whereas the tourist info said it was 300..hmm. Московский Кремль - Moskovskiy Kreml'...the area inside is quite vast, there is a park, numerous churches, the presidential palaces, several other large buildings, parking lots, roads, pavements..and some huge communist structure which I do not know what is. It is of course the seat of power in Russia, and was so for centuries. The first structures of the actual Kremlin were built here in the early 14th century, but the oldest remaining ones are from the early 15th century - such as the Annunciation cathedral. The existing walls and towers were built between 1485 - 1495, and the total length is 2235 metres. The height and thickness varies between 5 - 19 m and 3.5 - 6.5 m respectively. Apart from the notable palaces and churches, Ivan the Great's bell tower with the Tsar bell, largest in the world and weighing more than 200 tonnes is difficult to miss. Nearby is also a huge cannon with really large...balls! I'd hate to try to load it up and have one of them fall onto my foot! The Kremlin area is still mostly off-limits for tourists. As I tried my hand on a zebra crossing to get some distance to the cathedrals for a shot, I was stopped by a guard who said 'закрыт!' - zakryt - closed! And bedtime is as usual well into the night...01:30 or so. It is my last day, and I will spend most of it travelling and waiting. Not my favourite pastime, but there's no choice. I get to the airport without incident and am surprised to find a super quiet, shiny and very pleasant terminal E at Sheremetevo - quite contrary to the many negative reviews I have read beforehand. I am completely alone at the border/pass/visa control, and completely alone through the security check. Even better - Air Baltic has actually decided to fly this time! And this time I even get my pre-paid hot meal - really wow! I pick up a small bottle of vodka at the airport, but not before I check specifically beforehand with an employee in the shop - will they accept this as part of my hand luggage in Riga, with a seal outside the EU? Yes of course, is the answer. As I pick up my luggage, check in again (due to non-connecting flights) and go through security in Riga, surprise surprise..this bottle is not allowed, because "Moscow is not Europe". So Moscow must be somewhere in Africa then, I guess..or Asia, I think. Congratulations, you have been played with again. We wish you an otherwise pleasant day! Epilogue: Now that I have been to both St Petersburg and Moscow, how do the two compare? Well, in a way, they do not compare, as they are quite different cities. While both of them have many interesting sights, St Petersburg seemed much more quiet and pedestrian friendly. What far surpassed my expectations in both cities though was the quality of food. And now it makes me wonder why the Russian cuisine is not more widespread than it is - it is hard to find a single Russian restaurant apart from in really big (European) cities.